As now traditional for me I’ve had a dabble at a couple of wintery short xc races of late in a desperate attempt to kick start the hard training ahead and post xmas festivities ‘getting back on it’. Keeping things local(ish) first off I headed an hour south to partake in the last round of the Gillingham and District Wheelers winter xc series. This was definitely grass roots racing and on arrival at the car park in the woods by St Alfred’s Tower about an hour before race time there was only me and one other chap in sight. Have we got the wrong location, we both looked at each other and asked?! There were certainly no rollers or easy ups here. Eventually the organiser turned up in a van with a lunch box to receive the fiver entry fee (A FIVER!!!) and a few more cars arrived to make up the numbers. With plenty of time for a test lap of the short circuit through the woods it was clear this was going to be a muddy one. The technicality came from trying to keep things in a straight line down the gloopy forest road shoots whilst there were a few really sharp punchy climbs to keep the legs in check. I’d gone out for a few hours the day before so this would be a good chance to test some high speed endurance. Once I spotted Kim Little (Merida Factory Racing) on the start line I knew my lungs would be tested even trying to keep up for a lap. As it turned out I don’t think I even managed a lap as he shot off up the first climb. We did have a brief coming together whilst getting temporarily lost which allowed the rest of the field to catch up. Despite only being a small gang of us there were a few decent riders and I settled in 2nd but was getting hunted down by others from the off. I eventually ran out of beans on the second to last lap with a chap coming past me. I had gone full mudguards which is almost a never in a race but I reckon everyone else had about 1kg of mud stuck to their backs compared to me! Next up was the last round of the MAD XC series up in Gloucestershire. Based again at the National Trusts Ebworth Estate where forest roads are linked with nice little bits of singletrack. The organisers had to abandon most of the singletrack to preserve the woodlands after yet more disgusting weather had left things Somme like. Jon at E3 coach had really upped the pain for this weekend scheduling a 4 hour ride the day before then a couple of hours after the race to really finish me off. I knew during the practice lap that I was pretty empty and sure enough once the gun went I didn’t really get going. A few points at the front were fighting for the series overall prize so were off like a shot and I just slowly slipped back. After a couple of laps I really felt like throwing in the towel, this was not fun, let me curl up in a ball somewhere. I hadn’t been sleeping very well either which meant I was a bit zoned out. I kept on plugging though as it would have been easy to just call it a day but I reckon if you throw the towel once you know what it feels like therefore know how to do and it are more likely to do it in future. Tapping in to my 24 hour racing stubbornness I just got my head down and got on with it. DON’T EVEN TOUCH THE TOWEL I told myself let alone get hold of it. Weird that such mental battles can even happen in such a short race. Mercilessly I approached the start/finish line a minute before the cut off for a final lap, DON’T EVEN SMELL THE TOWEL and off I went for then final lap of trudging through leg sapping mud. I noted a couple of fast finishers had hunted me down and were within site so this gave me a bit more motivation to actually pull my finger out and put some more effort in for the last lap. I held them off and came in 10th. I did pick up a trophy, last year’s overall 2nd place in the series. Character building part 2 commenced straight after the race heading off on a mix of local bridleways (more boggy hell) and backroads to spin the legs for a couple of hours. I had stuffed loads of food in my back pocket so was able to take comfort in that at least. I made it back to event HQ just as the organisers were leaving and probably thinking “who’s this idiot?”! I’ve got a bit of a mission lined up next weekend to do the first 180miles of Aidan Hardings EWE mountain bike route www.aidanharding.com/ewe/. I’m aiming to make it across bleak Dartmoor on day 1, Plymouth to Barnstaple (100 miles) then Barnstaple to Bridgewater on day 2 heading across the steep climbs of Exmoor and then the Quantocks covering 80 miles. It’s a mix of bridleways, singletrack and national cycle network route. I just wanted something as an early season challenge to keep me motivated and I’ve always wanted to do a route across the two moors. I expect it to be fairly grim but a good mental challenge at this time of year, at least I’ve got a half way curry lined up with a mate in Barnstaple and a bed for the night to recharge. I’ve been trying to figure out how best to strap kit to my bike to keep things nice and lightweight but as a total amateur I’ll probably just end up stuffing a load of kit in my back pockets to avoid a rucksack. With the year drawing to a close it’s always the time to work out what next. I’ve had some quite deep and thought provoking conversation with Jon @e3coach about 2017. His obvious thought is to notch it up another level whereas mine was more like how on earth do I maintain that level with all the new life changes on the horizon. Jon proved he understands me far more than I give him credit for breaking down my current mentality and recognising how to harness this. For example it might come as a shock to many that I genuinely don’t go in to races wanting to win as my main goal! Keeping the fun in riding is important to me and keeping true to why I started riding, getting out there with mates having a laugh. This is increasingly difficult with a busy life and fitting in training but my mates are generally not (that) abusive if I fit in a couple of extra hill reps whilst out on a ride with them! So what next then… well firstly with some things that will be the same. I’m mega chuffed to say that I’ll be continuing will long term sponsors M Steel Cycles with some updated race weapons. Bristol’s Community Bike Café Roll for the Soul will be life saving again next year with spannering that avoids me breaking things myself. Exposure Lights will be keeping me lit on the trails again, simply the best lights out there bar none, I can’t actually quite believe how far they are ahead of the competition and there’s a reason why most people’s lights at 24 hour races are supplied by these guys. USE components will be mounted to the new race machine to keep things light and racey. I’ll be using Torq Fitness products again as they are the central element to my race day nutrition strategy and are always good to have a chat to about racing. The main new thing for next year with be joining up with Team JMC. I’ve known and respected some of the main guys behind setting this club up for some time. The experienced racers involved have always been happy to share their knowledge and it’s a testament to our sport that such a strong camaraderie exists between competitors. The club was originally started as a work place thing but has grown and expanded and is now a UK wide group of people who get together with a focus of fun and encouraging members to get involved in races and challenges across different sports. The club’s heartland also happens to be where I grew up so it feels even more special to be signing up. I’m looking forward to getting to know this group even more and pitting with them at races next year. As for races, after packing in way too many last year I’ll be doing a few less but the main goal will be the World 24 hour championships in Finale Ligure with is probably the best 24 hour course out there. The UK 24 hour champs are only 8 weeks following Finale so I’m going to play it by ear as to whether or not I indulge in that one. Other than that I’ll dabble in a few marathon events but we’ve got a DIY marathon on our hands with our new old and in need some TLC house so that will swallow up a fair bit of time. Painting is good core strength work right? It’s been a mad year of races races races. At the start of the year I had loads of stuff I wanted to do and I knew packing it all in would be tough. With the last race of the year, the UK 24 hour solo champs just round the corner I decided to go three weekends back to back endurance racing to get some good hard miles in the legs. First up was Torq in your Sleep where I wossed out and entered the 6 hour event given the weeks of training and racing ahead. It was awesome to be pitting with the E3 Coach gang and a good chance to catch up with buddies. I went of pretty hard at the start with fast lad Scott Cornish knowing the fast and flowing singletrack fun of Minley Manor which I was riding for the first time could easily see you slip back if you got caught in traffic. Sure enough, I got caught in a bit of traffic but in fairness Scott was too quick for me anyway. I didn’t really know who else I was racing so just cracked on and enjoyed the tight singletrack and reminded myself I should practice more riding this sort of stuff as I struggled to keep smooth and solid momentum at some points. 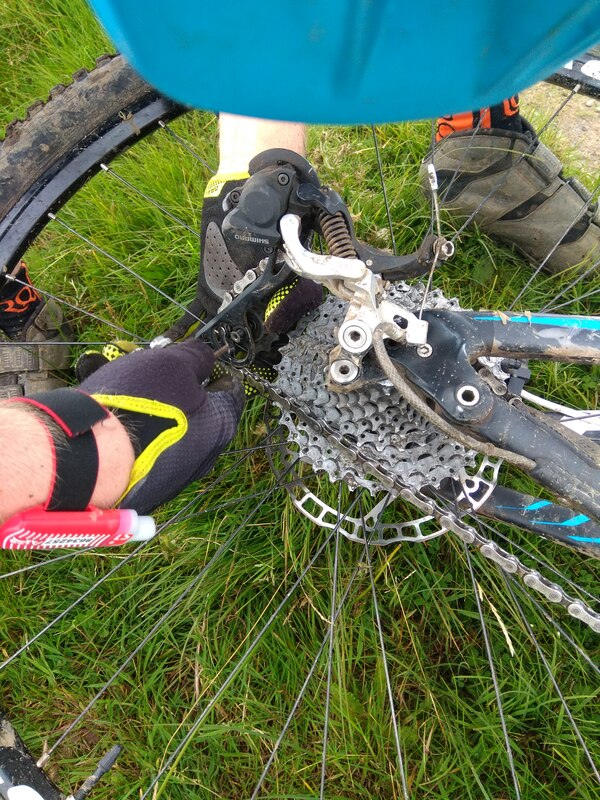 After a couple of hours having settled in, splat I found myself face first in the dirt with a hefty OTB, looking back down the (flat) trail in wonderment I spotted the offending stump I had caught a pedal on. I dusted myself off feeling some pretty sore ribs only to find that I had snapped my carbon railed saddle (ouch on body and wallet!). It was only a third way round the lap so I stood up for the rest of it. Fortunately I had brought a spare bike so my stand in pit crew (thanks Ingrid) and coach Jon quickly helped me hop about back up bike. After another 4th place at Kielder but having had a great day out I was looking forward to finishing things off at the MTB Marathon Ruthin weekend where I would do the usual double night ride and marathon the next day. This time though I had planned to do a double lap of the long course on the Sunday for good measure and to round of the three hard training weeks. After great fun on the night ride testing out the new Exposure Lights Six Pack and coming in second rider back on the shorter course I still felt relatively fresh the next day and was ready to take on a big day out. I then had to patch the tube which was now covered in tubeless gunk, by which time all but the back markers had trundled past. Ah well still plenty of daylight left as I wizzed past hoards of riders enjoying the day out to make some progress again. I stopped to recharge at the food stations for much longer than normal and eat loads of fig rolls to cheer me up and give me a boost for lap 2. About half a mile up from the last feed station, that sound appeared nobody wants to here, gush another puncture on the now tubed tyre, FFS. Walked back down to the feed stations, bought a tube, debated how much a lift back to HQ would cost, more fig rolls, carried on again. 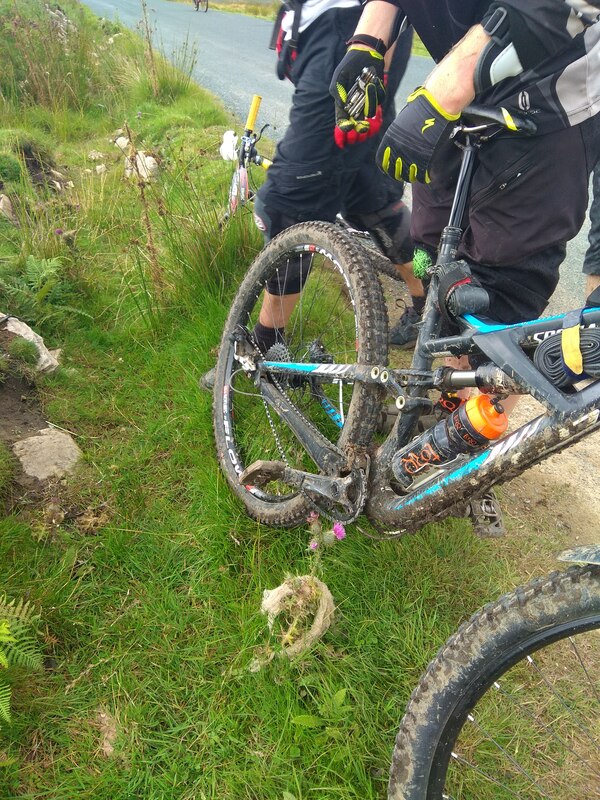 The day was getting on by this point and given that I would want to sort the tubeless setup out again for lap 2 I was rapidly thinking I should change plans or quit before anything more drastic happened. Still debating what to do on the final road decent, a wasp sting on the face made my mind up, this wasn’t my day! Philosophical I returned to base and after chatting to the organisers earlier about my plans they were keen to find out if I was on for another lap, talk is cheap so I headed back to the caravan for some ponderance and called it a day. We then had time for a much more socialable walk back in the woods where we had ridden through earlier which was a nice change of pace. Matt vs Ruthin wasn’t entirely over though and I got up at the crack the next morning to do most of Lap 2 which turned out to be great fun on the excellent course with a real variety of terrain. So the triple header weekends were completed and I was relatively unscathed (despite sore ribs from Torq) getting some decent miles in along the way.